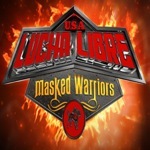 On Sunday in Albuquerque, "Lucha Libre USA" taped their Season 2 premiere episodes for the new season airing on MTV2 in January. Sunday’s Lucha Libre USA show opened about 30 minutes after the announced start time with a ten-bell salute to wrestler Chris Long, a/k/a Solid, who was killed in November. It was a stirring salute, with the entire locker room ringside to pay tribute. (1) tecnicos El Oriental & Tinieblas Jr. vs. rudos Treachery (Rellik and Sydistiko). There were a few missteps at times, with a few awkward mistimed spots, but overall a very fast, exciting opening match with some great tag team moves. The match ended with Sydistiko hitting a beautiful shooting star press for the pin. (2) The next match was a "first ever Mini Lumberjack Match” with female Rosetta Park taking on Mini Park, perhaps a grudge match arising from the fashion faux pas of both contestants wearing the identical full body skeleton suit. At ringside were various female wrestlers and “minis” acting as lumberjacks. I admit that I was a bit lost during this match. Mini Park was the tecnico here, but I found cheering for a man in full skeleton costume performing backbreakers and forearm smashes on a woman a bit suspect. Other than this it was a relatively entertaining comedy match, with Mini Park winning in the end and performing some great dance moves. For the final match before intermission (and presumably the main event of season 2’s premier episode) the Lucha Libre USA heavyweight title belt was brought out, and a fatal four-way elimination match was announced to determine the “first-ever” Lucha Libre USA champion. The contestants were Lizmark Jr. accompanied by his Treachery stablemates, Charly Malice, R.J. Brewer (a/k/a John Stagikas, who had a few stints in Ring of Honor), and Marco Corleone, a/k/a Mark Jindrak, who has been in WCW, WWE, and a few Mexican promotions. (3) Lizmark, Jr. beat Marco Corleone, R.J. Brewer, and Charly Malice in a four-way match to capture the Lucha Libre USA Title. This was definitely the highlight of the night, with a great pace and a lot of exciting spots. At one point, a man in a light blue mask came out ringside to help the tecnicos against Treachery's interference. Later, though, he turned heel and hit Charly Malice with...a Canadian Destroyer. After Brewer pinned Malice, the mask was taken off, revealing none other than Petey Williams himself. Brewer was soon eliminated after this, though, followed by Treachery throwing dust in Corleone’s face and allowing Lizmark to hit a super kick for the win and the championship. Again, great match, with all the participants really looking like viable main event stars for the small promotion. Jindrak in particular struck me as having a great physique and a tremendous physical prowess. After a 15 minute intermission, new champ Lizmark Jr. was brought out for an interview about his victory “last week,” alerting everyone to the fact that this was being taped for the next episode. Lizmark cut a good heel promo about his greatness, and told us that a painter was ringside to paint his portrait. Sydistiko then challenged any tag team to compete against himself and Rellik, bringing out the team of Magno and ROH’s Rocky Romero, making his debut with the company. (1) Treachery (Rellik and Sydistiko) vs. Magno & Rocky Romero. This was another fast-paced, exciting tag team match with a lot of quick tags and big spots, with even the larger Rellik hitting some great moves off the ropes. The match ended with Romero hitting his finisher - a very impressive move that starts as a Mickie James-esque jumping DDT and ends with Romero coming down for a RKO-eque cutter - and Magno hit a top rope splash for the pin. (2) Pequeño Halloween & Tigressa Caliente (Rhaka Kahn in TNA) vs. masked minis Mascarita Dorada & Octagoncito. This was another gender-bending match I didn’t quite get, though the fact that Tigressa Caliente was quite a bully to the very talented minis alleviated my apprehension somewhat. The minis won out in the end, with the help of another woman I could not identify who had a beef with Tigressa. After this match, Lizmark cut another promo about his painting, causing Marco Corleone to storm out and, after feigning respect for Lizmark, dumping a small can of yellow paint over both the painting and the champion. Petey Williams, billed as hailing from Glendale, Ariz., came out next accompanied by R.J. Brewer. The two are now collectively known as “The Right,” a rudo stable who, as per their moniker, spout conservative, anti-immigration rhetoric (referring to the crowd as a bunch of “ugly immigrants” after the match got the crowd nice and riled up). Finally, the audience was privy to a “bonus” legend vs. legend match between Blue Demon Jr. and Tatanka. Blue Demon came out with a blue cape, while Tatanka was in his usual Native American regalia. Dark Match: Blue Demon, Jr. vs. Tatanka. The crowd was pretty split, though there was slightly more audible enthusiasm for Blue Demon. Given the age of both men, the match had a surprising amount of more demanding physical spots, with Blue Demon hitting some front flip sentons while Tatanka was on the mat, and Tatanka making some believable rollup attempts. There were also a lot of chest slaps in the corners, with some Ric Flair "Whoos" heard throughout the audience for the first time throughout the entire show. Blue Demon won with a dropkick to the side of Tatanka’s face. After the match, Tatanka send the crowd home happy with a Samoan Drop on Demon. After the show, some wrestlers, including Supernova, sat at the merchandise table and signed merch for those who bought meet and greet tickets. Overall, it was a thoroughly enjoyable show that left me very excited to catch the second season when it begins to air and anxious to go back and watch the first season that I missed. There really were no dud or terrible matches, all the wrestlers really gave their all like they have something to prove, and the action was well-paced and based on enough classic face/heel interactions that they never devolved into an out-and-out spotfest (which wrestling like this seems especially at a danger of doing). The highlight was certainly the four-way championship match and the unveiling of Petey Williams. If this taping was any indication, I highly recommend checking out the second season of "Lucha Libre USA: Masked Warriors" when it premiers in January on MTV2.